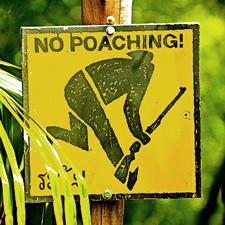 Poaching, definitionally distinct from hunting only by the artificial and abstract regulatory provisions of in-vogue parliamentary or congressional councils, strikes a largely-moral chord with its sponsors while piquing a less-prominent ecological interest in others. A cursory investigation into the history of poaching reveals a very sentimental or monopolistic refrain, whereby general assembly routinely ruled in favor of immediate public commercial or fiscal interest or its delusional counterpart of overtly-romanticized political expedience, a human anthology well-documented throughout the Oyster Wars, the Bering Sea Anti-Poaching Operations, the countless modern episodes of counterintuitive, destructive "ivory-crushing" protests, and the contemporary occasions of fines and imprisonment stemming from relatively modest, and might one dare describe it as "human" or "animalistic," demonstrations of innate survival strategy. The major distinctions across the spectrum of relevance, as far as the deaths of specific species may be concerned, seem to each time embody still-human, still-myopic interests, as we will surely seldom observe an instance of protest against the killing of spiders, insects, or free-range cattle, let alone the measurable and frequent disposal of less-animate, less-relatable species and the systematic processing of the goods which appear gracefully on the shelves at Kroger then eventually romantically at the candle-lit table for two at dinner with a complementary garnish and decadent glass of cabernet. Upon one's conclusion that one's behavior, here an act of survival optimization, warrants a sentence of imprisonment or fine, he or she concomitantly concludes his or her findings with a rough estimation of the value of the subject's actions, hereby effectively pricing the behavior out of the realm of morality and however-marginally yet potentially significantly mitigating its social repercussions. Pricing the supposed transgression transfers the behavior from the social forum to the market forum, condemning posterity, however far removed from this precedent, to a distorted value system built upon imprecise, incomplete, and inflexible standards of coercion and priced behavior, potentially permanently altering the course of human intuition and sensitivity to the subjects of innate survival strategy, the inherent qualities of human liberty, and the perils of systemic infringement thereupon and vestigial applications where these axiom-laden provisions are sure to further entrap and outlaw mere human behavior and out-of-vogue, supposedly uncivilized modes of survival.